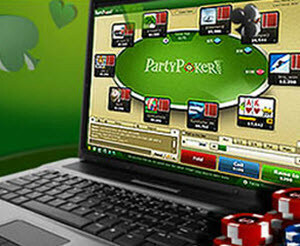 PartyPoker is a large poker room owned by the huge gambling company Bwin.Party Digital Entertainment. PartyPoker was launched back in 2001 and was a dominating force on the online poker market during the first half of the 2000’s. In 2006, PartyPoker withdrew from the U.S market. They took a serious hit as far as traffic was concerned, but saved their members from all the troubles that affected poker rooms like PokerStars and Full Tilt Poker in 2011 when the U.S. authorities clamped down on poker sites with U.S. players. Party Poker went through a major software revamp recently and the new launch has fixed a lot of the previous problems, while also improving graphics and animations. There is now a very easy to use quick-seat feature, live-action preview, better multi-tabling support, etc. 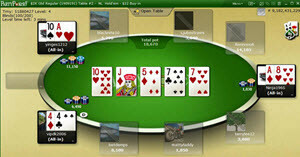 You can play 12 tables simultaneously and utilize functions such as table re-sizing, tiling, cascading, and stacking. A popular feature is the “hot hand alert”. Party Pokers variant of fast poker is called FastForward Poker. Just like all the other fast poker variants, FastForward Poker will move you to a new table as soon as you discard your hand. No more waiting around for other players to finish a hand that you are no longer active in. Party Poker has a lot of freerolls, including freerolls that are country specific. Not having to compete with the entire world can definitely be a big plus when entering a freeroll. PartyPoker also arranges tournaments where you use PartyPoker Points as buy-in instead of money. PartyPoker have qualifiers to big events running year round, and you can for instance win travel packages to World Series of Poker (WSOP) and Assie Millions. When PartyGaming purchased the World Poker Tour (WP), PartyPoker became a paradise for players looking for qualifiers to WPT events. If you’re looking for tournaments with big guaranteed price pots, the weekend is best because this is when Party Poker host their $300,000 GTD tournament. The buy-in for this tournament is $215, but satellites are available (including satellite tournaments where you buy-in using PartyPoker Points). The PartyPoker tournaments that tend to attract the biggest crowds are (unsurprisingly) the low buy-in No Limit Texas Hold’em tournament. One thing that sets PartyPoker aside from many other poker rooms is that you can find surprisingly soft games at mid stakes tables, e.g. $5/$10 Fixed-Limit. If your first deposit to PartyPoker is $25 or more, you get a 100% welcome bonus up to a maximum of $500. You have 120 days to clear your bonus. PartyPoker has a $50 recruitment bonus. PartyPoker offers reload bonuses now and then, usually a 20% match up to a maximum of $100 or $200. PartyPoker has received some pretty harsh criticism in the past for having a rather convoluted loyalty program, and it looks like they have taken the opinion of their players to heart because they have launched a new loyalty program that is much more straight forward. Play for real money, gather points and receive perks. If you gather more than 5,000 points you gain entry to the Palladium Lounge Club where you get access to VIP service, rake races, special rewards and invites to VIP events. English speaking support is available 24/7. You can call, use the live chat or send an email. The email address is infor@partypoker.com. Party Poker was launched back in 2001, so this is a well-established poker room to say the least. The owner, Party Gaming, is even older and launched their first gambling site – Starluck Casino – in 1997. In March 2011, PartyGaming plc merged with Bwin Interactive Entertainment AG to form Bwin.Party Digital Entertainment. This huge gambling company is headquartered in Gibraltar and listed on the London Stock Exchange. PartyPoker is available in over a dozen languages, and there is also country-specific sites for Italy and France (to comply with national gambling regulations).